Brigadier General Peter Hoene, USAF (Retired) was named President and CEO of SES Government Solutions on January 19, 2015. In his previous role, he served as the Corporate Vice President for Development for SES Government Solutions, headquartered in Reston, Virginia. The government and military of any country need instantly deployable, secure, high-speed communications networks that can deliver immediate access to mission-critical applications. The DoD continues to face the dual problem of dealing with the current atmosphere of fiscal restraints while simultaneously seeking to protect its space and communications assets from becoming compromised from an ever growing list of threats. As leaders from government agencies determine how best to develop a future space architecture, one thing is certain: Advances in technology will help drive a new approach to space. How long will my high power amplifiers last? This question has vexed many an operations manager, teleport engineer and capital planner for a long time. Certainly longer is better, but if I’m not ready with replacements, I have a definite problem. Geopolitical tension and instability are the ever-present reality of today’s connected world: a smoldering insurgency in Nigeria and Somalia, coordinated international strikes against ISIS, conflicts in eastern Ukraine, the Ebola response in West Africa, drug and human trafficking interdiction in Central and South America, heightened hostility in the South China Sea… and, as evidenced by the January attacks in Paris, even terrorism in regions long considered stable and remote from attacks. Military and consumer users demand wider bandwidth systems to support a broad range of services from higher data-rate communications to anti-jamming radars. As today’s security and defence threats become increasingly complex, airborne surveillance systems are critical to providing real-time, superior video over large operational areas. A Case In Point: KenCast is Well-Suited To Aid JMA’s HimawariCast, By Dan Delventhal, MBA, CBCP, Director of Sales and Marketing, KenCast, Inc.
Himawari-8 is the world’s first next-generation geostationary meteorological satellite. This year the Japan Meteorological Agency (JMA) deployed Fazzt data delivery from KenCast to use for their new HimawariCast service in order to disseminate the improved meteorological satellite data. Determining where you are in the world, in most cases, is simply a matter of tapping a map on your mobile device. That convenience comes courtesy of the U.S. Department of Defense Global Positioning System (GPS), a network of 24 satellites orbiting about 20,200 kilometers above Earth. 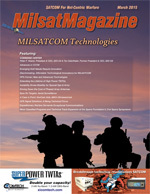 Expeditionary Warfare Demands Exceptional Communications, By Garr R. Stephenson, Jr., Head of the Airborne Comms-On-The-Move Division, UltiSat, Inc.
Today, the Department of Defense (DoD), other Government organizations and Commercial Industries, continue to manage strict spending conditions that affect their ability to meet current and future communications requirements. For 2015, the Space Foundation’s Space Symposium will offer more choices, more classified programs, more international and government participation and more networking opportunities than ever before in this important event.